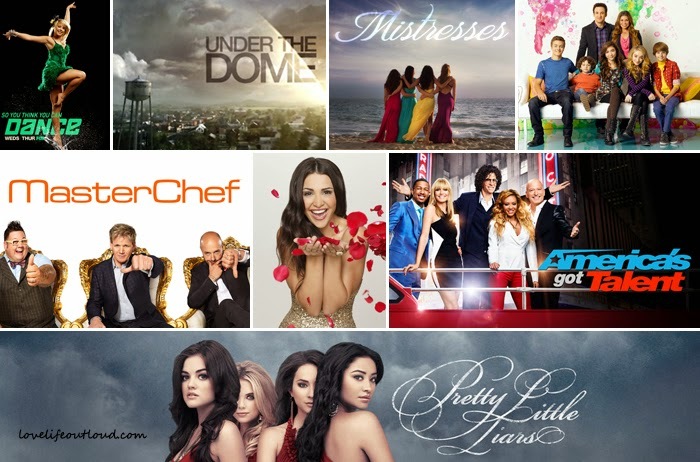 lovelifeoutloud: Feeding the Addiction: Summer TV Premieres! I'll admit it, I watch a ridiculous amount of TV to the point where it's a little unhealthy. I promise you I go outside once in awhile too...Summer is coming meaning all the summer TV is starting up again! This means the return of competition shows as well as a few guilty pleasures. I want to share a few shows that I'm just extra excited to start watching again. Typically I don't like watching The Bachelorette because watching guys fight over a girl and all their drama is kind of annoying, but I just fell in love with Andi last season and I just want more of her! I'll confess I definitely fast forward through boring dates and the majority of the rose ceremony because the two hours just kills me but I'm still completely invested in the outcome of her experience. I wasn't crazy over America's Got Talent until I randomly started watching it last season and discovered the magical chemistry between the judges. I LOVE Heidi Klum, she is just amazing and her alone makes it worth watching. I do wish that they didn't insist on such a long and separate results show, I mean I understand why they do it since it's live voting but personally I think I can wait until the following week and just find out at the beginning of that show. I'm still waiting for the day when the Exorcist can finally get it altogether and make it onto the actual show for So You Think You Can Dance and my fingers are crossed that he will make an appearance at the auditions again this year! This is another one with the unecessarily long results show and often there are time conflicts with AGT but I just love the dancing and the theatrics in this show. The jury is still out about how I really feel about Mistresses but it's one of those nice fluffy shows that is attempting to replace one of my all time favorites, Desperate Housewives. I watched Charmed growing up so it's great to see Alyssa Milano acting again, I really haven't noticed her in anything ever since that show ended. And of course the real one I'm here for is Yunjin Kim or Sun from Lost! As much as I hate the producers for keeping us guessing, of course I am SO excited for Pretty Little Liars. I feel like I ramble about this show too much so I'm just stopping it here. It's the guy from Breaking Bad playing basically the same character! I have a love/hate relationship with Under the Dome. I was intrigued by the commercials and pilot and then the acting and dragging story line got worse as the episodes crawled by. However I persevered simply because when it started it was promised to be a 13 episode mini series so I kept watching just because I was curious about the dome. Then I find out they got greedy and decided to stretch it into a real series, so now I'm stuck watching I show I basically hate just because I'm dying to know the truth. Lastly...GIRL MEETS WORLD!!!!! Boy Meets World was hands down the best show ever and I am SO excited for this spin-off! I've been tracking it obsessively and I'm so excited that the premiere date has been set in June!! What are some shows you're looking forward to indulging in this summer?